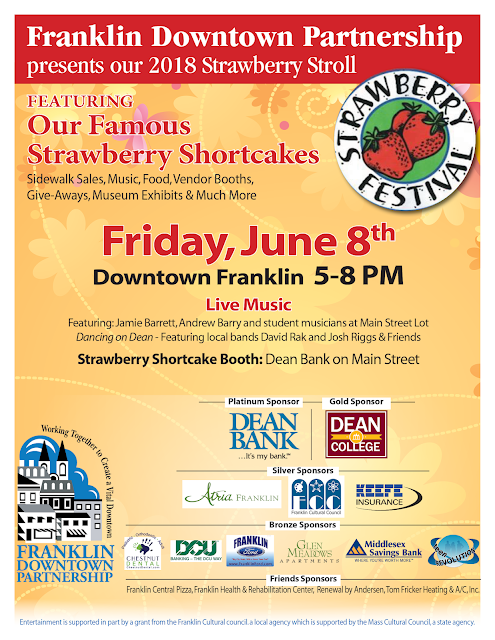 "The town has deemed the strawberry shortcake a staple of summer, and in 2002 Franklin made it a point to celebrate the fruity dessert with a Strawberry Stroll. 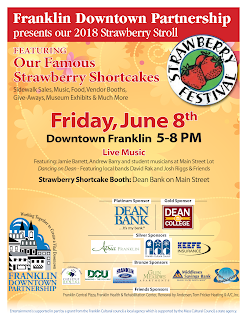 Sixteen years later, the stroll will shut down the roads on half of downtown and down Dean Street where more than 100 vendors and two live music performances on Friday evening from 5 to 8 p.m. will bring the spirit of summer to Franklin. This will be the first time the event is held on a Friday. The intention is to get families to spend time in local stores and restaurants throughout the night. It’s easy to say that there are more than a few residents that mark the event on their calendars, said chairman of the Downtown Partnership, Lisa Piana."